The euro crisis, Japan’s sluggish economy, and partisan disagreements in the United States about the role of government all have at least one thing in common: worries about high levels of public debt. Nearly everyone agrees that public debt in many advanced economies is too high to be sustainable and must be addressed. There is little agreement, however, about when and how that addressing should be done—or even, in many cases, just how serious the debt problem is. As the former director of the International Monetary Fund’s Fiscal Affairs Department, Carlo Cottarelli has helped countries across the globe confront their public finance woes. He also had direct experience in advising his own country, Italy, about its chronic fiscal ailments. In this straightforward, plain-language book, Cottarelli explains how and why excessive public debt can harm economic growth and can lead to crises such as those experienced recently in Italy and several other European countries. But Cottarelli also has some good news: reducing public debt often can be done without trauma and through moderate changes in spending habits that contribute to economic growth. His book focuses on positive remedies that countries can adopt to deal with their public debt, analyzing both the benefits and potential downsides to each approach, as well as suggesting which remedies might be preferable in particular situations. Too often, public debate about public debt is burdened by lies and myths. 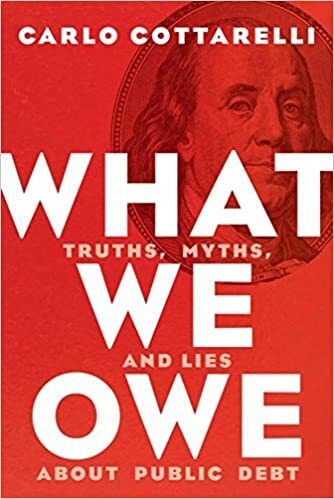 This book not only explains the basic facts about public debt but also aims to bring truth and reasoned nonpartisan analysis to the debate.